How would you like to have ALL of your dealership’s Customer Relationship Management (CRM) prospect leads, various websites & OEM lead sources, and new purchase customers contacted on an ongoing and daily basis to REALLY help your business grow? This is a fully managed service, and designed to be a timely and targeted email deployment strategy that digitally communicates to all your CRM customers. 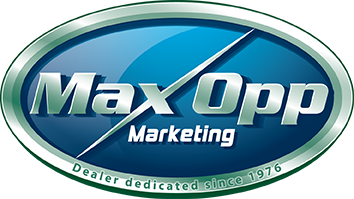 To find out more about how this program can increase YOUR business and raise customer satisfaction, please contact MaxOpp Marketing at (760) 494-0294 or info@maxoppmarketing.com. Now would be the perfect time to give it a try for 30 days with no obligation. Term: No term commitment required. Monthly Investment: $449 monthly for up to 50 sold units. Please contact us to discuss fee specific to your volume. $350 one time fee. Provides evaluation of current setup, contact letter creation, and integration. Rejuvenation Service: Optional service. Analyzes existing sold unit database and pushes backwards to initiate contact strategy. Contact us to discuss one time fee for service.